As you can see it's all about Football recipes this weekend. These bite sized sandwiches make a perfect game day meal. They also get bonus points from me because they are made in the crock pot! Add all ingredients except for the cheese and bread to your crock pot. Cook on low for 8 hours or high for 6. Shred beef and spoon into rolls. 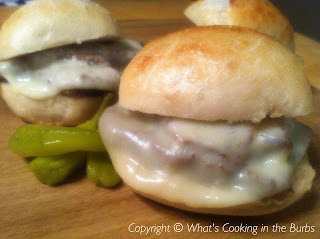 Top each slider with a slice of provolone cheese and broil on high for 2-3 minutes or until cheese is melted and bubbly. Serve with a side of extra juice, if desired. Enjoy! There's still time to put this on and have it ready for the game! This sounds tasty. Thanks. Sounds so good! Thanks for the great recipe. These look delicious. I love new crockpot recipes! Oh my Hubby would love this! Mmmm, this sounds like wonderful spicy beef sliders!! Thank you for linking up to Simple Supper Tuesday! Interesting that you put your pepperocini in with the meat, I've always just served it on the side...nice..I bet that is a nice little kick. Oh my goodness... could these look any more delicious? Yum! I think you put this up once before, and yes it is fabulous. Big hit for my family. It seems friends of mine have picked up on this recipe too. I do believe you are a hit in the Chicago burbs for sure!